Sunburst Shutters New Brunswick offers you all you could ever possibly desire from a window shutter. Plus a whole lot more! Plantation shutters in New Brunswick are the perfect window treatment for your home since they are excellently made - both inside and out! Their thick louvers give your window a clean, modern look. And we manufacture our plantation shutters to give you energy efficiency and endurance so your lovely investment provides huge savings and added value. Plantation shutters are incredibly versatile, too. By merely tilting the louvers, plantation shutters let in all the view and sunlight you need. The louvers are the slats that you can adjust to increase – or decrease – the light you let into the room. They can be adjusted by using a mounted tilt rod. 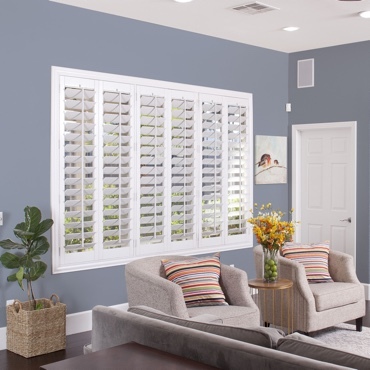 Whatever your specific needs might be, from unique window shapes and color matching to frame design, Sunburst Shutters New Brunswick has the interior shutters to work with your home. Why are they called plantation shutters? Plantation shutters get their name from their regular usage in expansive mansions and plantations, especially in the American south, where they were desired for their elegant aesthetics as well as their capacity to block heat from coming inside. Which kind of shutter should I choose for my kitchen or living room? Any room will have a few special needs. For that reason, we've created our Complete Room Window Treatment Guide to help you pick the best option for each room in New Brunswick houses. Where are plantation shutters built? Polywood plantation shutters are one of the only shutters that are completely constructed and put together in the U.S.A. The different louver sizes of plantation shutters provide you with the most unobstructed view of your New Brunswick neighborhood while looking beautiful on your windows. Plantation shutters give you the ultimate light, temperature, and privacy, privacy, light, and temperature control of any window treatment. Varying louver sizes can also mean less louvers across your window. These large louvers give plantation shutters their fresh feel. A modern style and effortless control of brightness and temperature make plantation shutters the preferred choice of interior shutters in New Brunswick. Because of the way they’re placed on your window, plantation shutters become an enduring fixture. When your house is valued for resale, plantation shutters add to its estimated market value. You get to enjoy your shutters right now – and gain back your investment later, when you sell your home. It’s a win-win situation. We fashion plantation shutters that accent your window and your home impeccably. That’s why we carry these exceptional brands of custom plantation shutters. Composed of a composite wood substitute, Polywood® plantation shutters won’t warp, chip, split, or crack. Not only that, but the color on these shutters will never yellow or fade. That’s because we bake on our first-grade paint finish and pair it with UV stabilizers that make the premium synthetic resistant to the sun’s rays. So, no matter how intensely the New Brunswick sun shines, your shutters look as beautiful as the day they were first installed! Polywood plantation shutters are also the benchmark for insulating shutters, making your home more energy efficient than ever. Read about the Polywood Insulating System® to discover the energy efficiency benefits Polywood shutters can offer your house. We custom craft all our Polywood shutters so they look beautiful on your New Brunswick windows – and work effortlessly every time you open and close them. If you want a premium wood plantation shutter, you’ve found it. Ovation® hardwood shutters are crafted from solid teak so you won’t have any doubt that they are built for durability. A five-star wood shutter, Ovation shutters are provided in various louver sizes that are built with furniture-grade hardwood. Have a specific color set up to accentuate your decor? Ovation plantation shutters can be found in 28 unique wood stains and 11 different paints, so it's possible to exactly match your previous window trim or complement the colors of your space. We manufacture all of our Ovation plantation shutters to cover your New Brunswick windows perfectly and work smoothly. Add a contemporary touch to your home with reclaimed wood shutters. Every shutter louver has its own specific finish and color, crafted by none other than Mother Nature. We custom make these shutters to complement any window in your home. 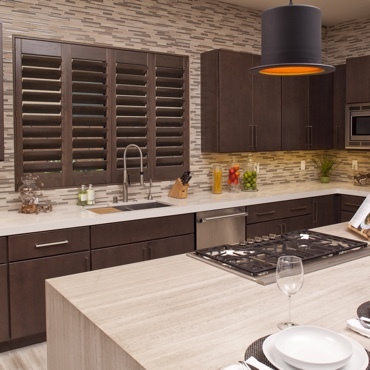 Studio shutters are a brand-new offering from Sunburst Shutters New Brunswick. Uniquely built to offer both the stunning looks of plantation shutters as well as unrivaled value, Studio shutters are a sleek, smart window treatment. Schedule a free in-home consultation today by calling 732-301-6168 or filling out the form below!